Does Your Missal Obey Pope Paul VI? ERE IS A QUOTE you might enjoy. It comes from Very Rev. Edward Eugene Malone, O.S.B., who (among other things) was a seminary professor at St. John Vianney Seminary in Nebraska. By the way, does anyone know if that seminary still exists? If so, let us know in the combox. In many missals offered for the use of the layman, the tendency has been in recent years to eliminate the Latin texts altogether. This was probably not the wisest policy. Whatever concessions may be made to the laity in the future in the use of the vernacular in the Mass, the text of the Mass said by the Priest will most certainly remain in Latin. The new missal makes a desirable compromise by presenting the principal parts of the Mass in both Latin and English. In a world in which Catholics travel from one continent to another in a matter of hours, the Latin of the Mass gives them a sense of being at home at least in church, wherever they may be. Moreover, whatever other changes in the Mass may be forthcoming, the sung Mass is still apt to be in Latin. No suitable melodies have been yet fashioned to fit the vernacular text of the Mass. Gregorian Chant is apt to remain the singing voice of the Church for a good many years to come. At the end of this blog entry, I’ve included a link to the entire piece, which is worth reading. 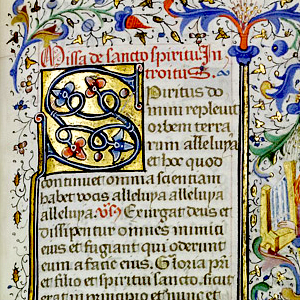 As our readers know, the Campion Missal contains both English and Latin, and we will soon be releasing a second edition (which we’re very excited about), but that’s not what I wish to mention at this time. HAT I FIND INTERESTING, (as you may have already guessed) is that Fr. Malone assumes Latin and Gregorian chant will always be part of the Roman Rite. That is what the Second Vatican Council called for, but, as we all know, it did not happen. One easy way to find out if a priest is truly committed to the teachings of the Second Vatican Council is to observe whether his parish Masses give Gregorian chant “first place” (Sacrosanctum Concilium, §116), employ Latin (Sacrosanctum Concilium, §36), and hold the pipe organ in high esteem (Sacrosanctum Concilium, §120). His Holiness Pope Paul VI gave this mandate specific approval and confirmed it by his authority, ordering that it should be published and faithfully observed by all concerned, beginning on 7 March 1965. Sadly, it has not been followed. Just the other day, I attended a wedding wherein the priest was trying to use a lot of Latin. He was forced to have two (2) Missals on the Altar at all times, and it was a mess. That’s really sad. The publishers ought to have listened to Pope Paul VI.